Amy Poerschke, who received an Ed.D. in professional leadership - K-12 in 2017, is principal of Durham Elementary and also an adjunct professor in the Department of Educational Leadership & Policy Studies. Posted April 9, 2019 – At 8 years old, Amy Poerschke knew what she wanted in life. She had gone to her older brother’s college graduation and admired the fancy regalia worn by students in the front row. On Oct. 3, 1996, in second grade, she declared her dream as part of a class assignment. “I’m going to get a doctorate,” she wrote in pencil in perfect cursive. The piece of paper now hangs framed on her office wall at Durham Elementary, where she serves as principal. Also hanging: her three diplomas – from Baylor University, where she earned a B.S. in early childhood education; the University of St. Thomas, where she earned an M.Ed. in educational leadership; and the University of Houston, where she earned an Ed.D. in professional leadership – K-12 in 2017. Poerschke has since accomplished goals she didn’t know she had. In February, she won the Elementary Principal of the Year Award from the Houston Independent School District. 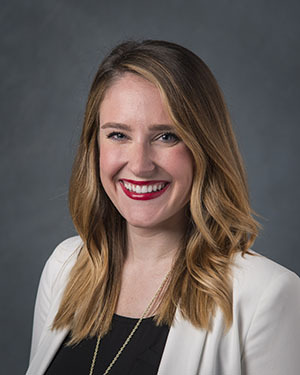 And this month, a week after turning 31, Poerschke will receive the UH College of Education’s 2019 Rising Star Award, given to outstanding young alumni. Associate Professor Bradley Carpenter, who directs the College’s school leadership programs, praised Poerschke’s success as a principal and an adjunct professor for the College. She serves as a teacher and role model for future administrators. “Her energy, passion and commitment to the betterment of our programs and the public school children of Houston ISD deserve recognition by her peers and the broader University of Houston community,” Carpenter said. Poerschke, pronounced “purse-key,” grew up in Fort Worth, raised by a single mom working multiple jobs while her dad was estranged from a young age. Poerschke said her mom made sure she attended good schools, driving her across town. She recalls an especially kind elementary school teacher, Ms. Gapp, who inspired her future career. But even as a teenager Poerschke realized she had opportunities other children didn’t. It bothered her. Why weren’t all the students encouraged to take Advanced Placement classes or offered SAT preparation? Poerschke went on to study education at Baylor, where her brother went, and then took a non-traditional route into the classroom, drawn to help students in need. She entered Teach for America and came to Houston ISD, teaching third grade at Dodson Elementary the year before it was closed. “It was a shocking entry into public education in Houston,” Poerschke said. 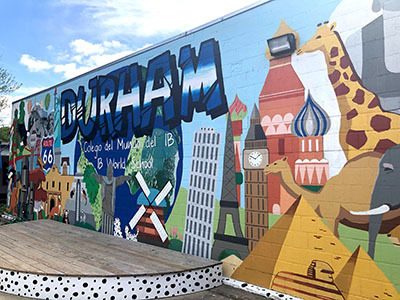 The once-gray walls of Durham Elementary are now adorned with murals that represent the diversity of the school. For the next five years, Poerschke worked at Garcia Elementary, as a teacher, a specialist and then an assistant principal. She loved teaching, creating a classroom where her students could thrive, but wanted the chance to set up that environment school-wide. She earned her master’s in educational leadership in 2014 and a few months later started the doctoral program at UH while working at Garcia. A year into her Ed.D. classes, she became principal of Durham Elementary, a once-struggling school on the rise, located in a north Houston neighborhood where mobile homes share space with mansions. On a warm, windy afternoon in late March, Poerschke paused in the courtyard at Durham. A mural of the world – with the Golden Gate bridge painted on the left and the Eiffel Tower on the right – serves as backdrop for umbrella-shaded tables where about 100 parents join their children for lunch on any given day. “It truly is a community school,” Poerschke said. About 62 percent of the students are Hispanic, 25 percent are white and 12 percent are black. Around 60 percent are economically disadvantaged. A class of kindergarteners walked by in a straight line. With numerous principal changes preceding her, Poerschke said the school needed consistency. While Durham’s scores on state exams have risen significantly, Poerschke said her teachers don’t focus on test prep and worksheets. The school has an International Baccalaureate designation, emphasizing projects and global leadership skills, and offers a dual-language program, where students learn together in English and Spanish. Murals representing different countries adorn once-gray walls, and students garden in an outdoor classroom. Earlier in the semester, Poerschke got “the surprise of a lifetime” when she walked into the Durham auditorium. HISD Interim Superintendent Grenita Lathan was there to announce she was the Elementary Principal of the Year. Another UH Ed.D. graduate and adjunct professor, Khalilah Campbell-Rhone, won HISD’s Secondary Principal of the Year Award. In addition, M.Ed. graduate Sean Negron won Elementary Assistant Principal of the Year and Ed.D. student Thomas James Cotter won Secondary Assistant Principal of the Year. Despite her busy schedule, Poerschke teaches graduate students at the UH College of Education one evening a week. For the last two years, she’s taught Data-Informed Decision Making for School Leaders, sharing real-world advice about analyzing student data, designing budgets and organizing limited hours in the day. But it’s not only about the numbers. Students praise the rigor of her class.